AKA Embroidery, Print & Design works with a large customer base to supply a wide range of embroidered designs and apply them to everything from workwear , corporate clothing, personalised items for sporting clubs, associations to individuals , "One Of" Items and personalised embroidered badges & patches. Using our in house commercial embroidery machines we take a customers brand or design and recommend the best method of application to suit the garments and the use they will be put to. Embroidery works well on many fabrics and is ideal for branding most of the products we supply and will prove to be tough and resillient and tolerate very rough treatment. The creation of an embroidery file involves us creating the design in a format that is compatible with our top quality, multihead commercial embroidery machines. 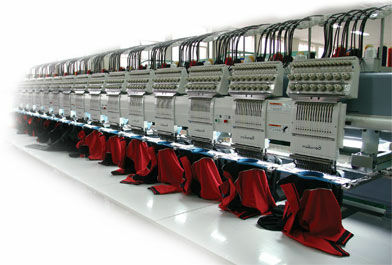 To achieve this, we must closely examine the supplied design as a group of objects and plot the sequence of objects and colours to ensure that the flow of the design is maintained, meanwhile creating a pattern of sewing to eliminate unecessary trims and machine stops throughout the running time of the design. There are many factors to take into consideration, Including Logo / design choice, fabric type, heaviness of stitching and stabilisation of fabric to ensure a smooth professional finish. If you have a logo or design and would like it to be embroidered, All you need to do is contact us for a quote and email or supply a graphic / digital file in the following preferred types.